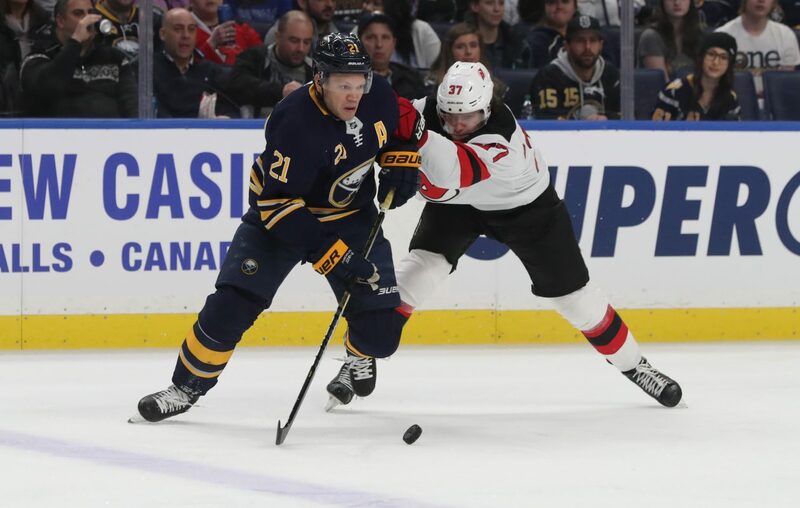 The Buffalo Sabres' power play has dropped to 21st in the NHL at 17 percent and the lack of offense with the man advantage has been a big contributor to the team's struggles in recent weeks. Coach Phil Housley tinkered with a four-forward approach in practice Monday that had Kyle Okposo joining Jack Eichel, Jeff Skinner, Sam Reinhart and Rasmus Ristolainen. The Sabres may use it during Tuesday's game in Columbus. "Scoring chances don't count anymore. We have to have production," Housley said. "There's time in the past 10 games we've had really good opportunities and the goalies have made good saves. That's not an excuse. It's all about production." The second unit Monday had Casey Mittelstadt between Evan Rodrigues and Conor Sheary, with Rasmus Dahlin and Tage Thompson in the rear. The Sabres' power play is 0 for 13 over the last four games, just 1 for 22 in the last eight games and 4 for 41 in the last 14. The next two games will be a tough challenge as Columbus is eighth in the NHL on the penalty kill and Dallas is seventh. "It's a good time to work on it today, move the puck around, keep it simple," Housley said. "We used Kyle back on that flank and I thought both units moved the puck really well. We've got to work on it because we're not getting the results.